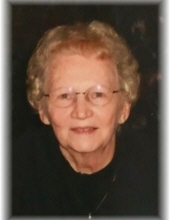 Beverly Jean Swope, 84, of Bowling Green, Ohio passed away Sunday January 20, 2019. She was born September 27, 1934 in Bowling Green to Russell and Myrtle (Gonyer) Augustine. She married Robert E. Swope on October 3, 1953 and he survives in Bowling Green. Beverly enjoyed cooking, baking and preparing meals and a loving home for her family. Her greatest joy in life came from the time spent with her family, especially her grandchildren. Along with her husband of 65 years, Robert, she is survived by her son Ross Swope of Bowling Green, daughter Susan (Doug) Fiebelkorn of Bowling Green and grandchildren Alexis Fiebelkorn and Austin Fiebelkorn. She was preceded in death by her sisters Shirley Woda, Rose Hoot, Ruth Smith and Ethel Mae Augustine. Services were held privately for family with interment at Union Hill Cemetery in Bowling Green. Arrangements have been entrusted to Dunn Funeral Home in Bowling Green. Memorial contributions may be given in her memory to St. Jude’s Children’s Research Hospital, P.O. Box 1000 Dept. 142 Memphis, TN 38148-0142. To send flowers or a remembrance gift to the family of Beverly J. Swope, please visit our Tribute Store. "Email Address" would like to share the life celebration of Beverly J. Swope. Click on the "link" to go to share a favorite memory or leave a condolence message for the family.